With OneDrive, we want to give you one place for all of your stuff: your photos, videos, documents and other files. Of course, to do this, we need to make sure you actually have enough storage space for everything, particularly given that the amount of content everyone has is growing by leaps and bounds. It’s also clear that you want more than just the ability to store your stuff in the cloud. You want to be able to share it, to collaborate on it, and so much more. The landscape is changing to the point that we believe it’s no longer enough to provide only cloud storage — that’s table stakes. We want to provide a complete experience that brings in the power of Office and lets you do more with everything you put in your OneDrive — whether it’s sharing your favorite photos with the people you care about in one simple click or working together in real time on an important project. Our data tells us that 3 out of 4 people have less than 15 GB of files stored on their PC. Factoring in what they may also have stored on other devices, we believe providing 15 GB for free right out of the gate – with no hoops to jump through – will make it much easier for people to have their documents, videos, and photos available in one place. 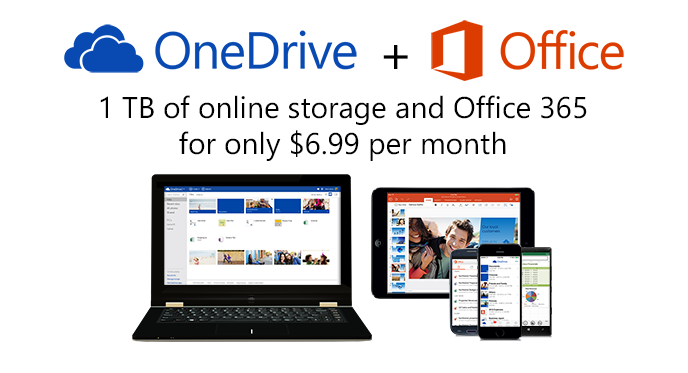 Soon you will get 1 TB of OneDrive with your subscription to Office 365. This means you will get the power of the world’s most popular productivity suite, Office, along with apps for your laptop, smartphone, and tablet, plus an enormous amount of storage, for an unbelievably low price. For Office 365 Home ($9.99/mo) you’ll get 1 TB per person (up to 5 people), and with Office 365 Personal ($6.99/mo) and University ($79.99/4yr) you will get 1 TB per subscription. This is a great follow on to our April announcement that all OneDrive for Business customers will get 1 TB of cloud storage per person too. Of course, we also want to give you as much flexibility as possible, so if you need more storage, but don’t need an Office 365 subscription, we will also still provide monthly subscription storage options – at dramatically reduced rates. The new monthly prices will be $1.99 for 100 GB (previously $7.49) and $3.99 for 200 GB (previously $11.49). All of these updates will take effect in the next month. For current subscribers, you are all set, you’ll automatically be moved to the lower prices. We’re really excited to bring more storage to OneDrive so you have all the room you need to store all of your photos, videos, and documents in one place. If you haven’t yet signed up for OneDrive, you can learn more and sign up at http://onedrive.com/.